Singing Maching SMT423 Sing Along Cassette Player/Recorder - Cassette Player/Recorder, AC/DC; Includes two pre-recorded Multiplex Karaoke Cassettes; For ages 5 and up. 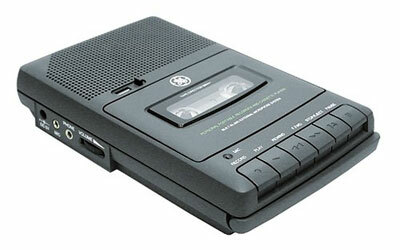 GE 35027 AC/DC Shoebox Cassette Recorder - Features Automatic Level Control (ALC) during recording. Built-in condenser microphone. Sliding carry handle. Includes digital tape counter. Automatic shutoff at end of tape. Stereo Cassette Player Kit - The only thing better than getting a new stereo tape player is building one yourself--and learning all about electronic circuits and magnetic recording theory (and much more) along the way. This 48-piece kit includes all the parts you need to build your own stereo tape player, with headphones. No soldering is required, since the printed circuit board is already assembled and tested. A very thorough and user-friendly instruction manual has large, full-color graphics that make the assembly process (about 3 hours) easy to understand. The manual also includes helpful diagrams, schematics, and explanations that teach you how the finished product works. The completed tape player has a clear plastic case so you can see the internal parts at work and marvel at your accomplishment. Crayola Sing-A-Long Recordable Cassette Player - This Crayola cassette player has a sturdy, yellow plastic body with bright crayon-tip buttons and an oversize, crayon-shaped microphone. The player has a volume limiter switch to protect children's hearing and a headphone jack for individual listening. The crayon-shaped microphone is somewhat difficult to hook and release, but works great when the tape mechanism is playing. There's very little tape noise or hiss during play, but there is some distortion at top volume. One nice feature is the recessed tape holder on the back of the player--it's a great way to keep track of that second cassette tape (without the box). While the crayon-tip buttons are fun and stylish, they are somewhat more awkward to use than traditional, square buttons. All in all, this is a stylish cassette player that offers nice sound and features for the price. Personal Stereo Cassette Player With Speakers - A Personal Stereo Cassette Player with Speakers, an inexpensive plastic-framed portable audiocassette player system, powered by two AA batteries (not included). Designed for children ages 4 years and older (according to the instructions; the box says "3+"), this kit features a volume limiter for young ears, simple circuitry, bright colors, and a pair of small speakers.